Cloned from Teka by architaraz. Info: Created on 6th February 2013 . Last edited on 8th February 2013. Some suggestions for S,8 and 3 and how to erase invisible block? @winty5:Give me suggestion to lc x & to W & w, please (I'm using some composites). How to make "FS" samples as in last comment? Nice clone! But if you examine Teka, you'll see some elements like bold-thin line connections, overshoots etc, and these elements help create a certain style. This is what I think you need in your font - a style. Try searching for "sans" in the Gallery, I'm sure there are plenty of fonts similar to your Better Sans. Thanks for experimenting with Teka. 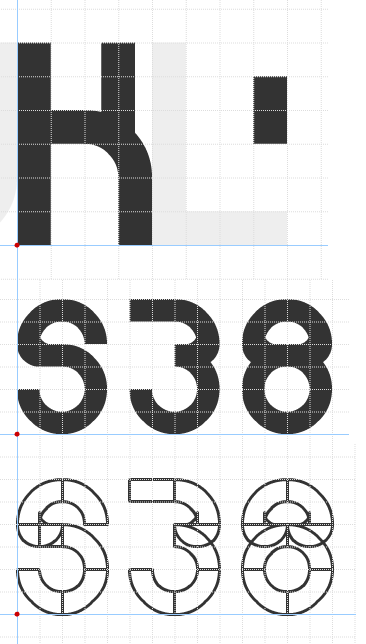 @architaraz: This font now have style. @architaraz: As elmo's stencil zkandia eYe/fs. They very simple edits to what you have now. I'm sure you'll be able to figure them out.